When my sister and her husband came up last weekend to take a trip to the zoo with us, I wanted a cool and refreshing dessert for us to enjoy. 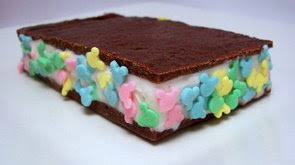 I didn't have a ton of time to make anything because we were busy trying to get things together and clean up the house, but I didn't need much to make these Classic Ice Cream Sandwiches. While cookies make an excellent vehicle to sandwich with ice cream, for these, we made a very thin cake that I was able to get into the oven with just a couple minutes worth of work. For a deep chocolate flavor, I used a Dutch-process cocoa powder, but since there is no leavening in this, you can switch that with natural cocoa powder without worry if that is what you have in the pantry. Being so thin, the cake cooks very fast and it is also fairly flexible, but you don't want to be too rough when working with it. I do highly suggest lining the baking pan with parchment paper to make life easier when turning it out. 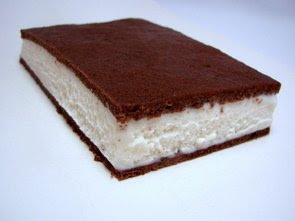 Instead of making individual sandwiches at first, we made one big honkin' sandwich by slicing the cake in half (crosswise), smearing on a couple pints of softened vanilla bean ice cream on one half and then slapping the other half on top. Wrapped well in plastic wrap, we placed the assembled slab into the freezer to firm the ice cream back up until we were ready to serve it. We then sliced it into individual bars to recreate that classic shape. And since you know that Jeff is such a big Mickey fanatic, you can just about guess what I had to do next, right? He made sure that we ran the edges of the sandwiches in these fun candy sprinkles that I had in the pantry before anyone got to take a bite. I thought these were somewhat reminiscent of those frozen wrapped sandwiches I had growing up in the summer time with that stick-to-your-teeth cake-y layer on the outside! As I said, I used a good-quality vanilla bean ice cream for this batch, but do feel free to use whichever flavor you like. I know I want to try these again with a chocolate chip mint (swoon!) ice cream and rolling the edges in chocolate jimmies. You could even make them a little more striking by doing layers of ice cream like vanilla, chocolate and strawberry - use your imagination and have a blast! For tonight's dinner, Italian Meat Loaf with Fresh Basil and Provolone, I changed a few things from the original recipe as I wanted to heighten the flavor a bit. Rather than using all ground sirloin as the recipe called for, I took a cue from the last meat loaf we made and added a link of hot Italian turkey sausage into the mix. 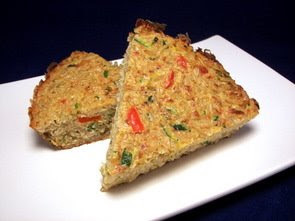 It also called for a seasoned breadcrumb, but I used a combination of panko breadcrumbs with fresh rosemary, dried oregano, dried basil, granulated garlic and crushed red pepper to season those coarse crumbs up. 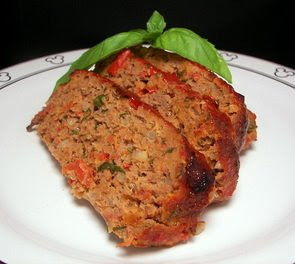 Also pumping up the flavor in this meat loaf are re-hydrated sun-dried tomatoes, chopped onion, ketchup, fresh basil, garlic, an egg to help bind and shredded provolone cheese. I suggest keeping the onions fairly small in size - while they do get tender while baking, their texture is more firm. If you or your family is fussy about that, I suggest sautéing them (let them cool a bit too) before adding them in. To let some of the the excess fat drain away, we shaped the meat mixture into a loaf and placed it on a broiler pan to cook. If you want to make this process quicker and ensure an even loaf, you could press the meat into a loaf pan and then flip it out onto the broiler pan - however, this does dirty another dish! When it came out of the oven, we made sure to leave it rest for about 10 to 15 minutes - this way we got clean slices that held together well. If you don't wait, it won't ruin the taste, but it may not hold together well. The result? We loved the intensity from the sun-dried tomatoes - the breadcrumbs lightened the mixture up enough so it didn't feel like eating a burger and the sharpness from the provolone was welcome. Quite moist, I think this solidifies the fact that I will continue swapping out some of the meat with a link or two of Italian sausage (sweet or hot, depending) in future recipes as it really amped up the flavor. PS - Yes, I'm doing a little happy dance right now... guess what I'm having for lunch tomorrow? 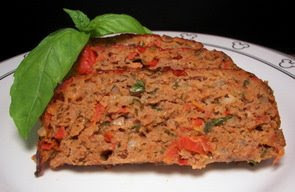 Meatloaf Sandwich - I can't wait! 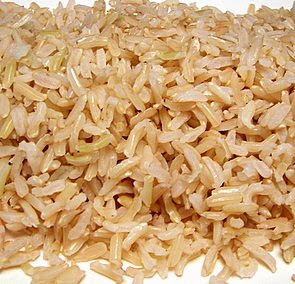 Do you have a favorite method of cooking rice - especially brown rice? For the longest time, I've always just done the absorption method, usually using a ratio of a scant 2 cups water to 1 cup of rice. However, lately I've been using the pasta-style method that I read recently while browsing through a book by Alice Waters. Basically, you bring a large pot of water to a boil, salted if desired, toss in rinsed brown rice and let it boil, uncovered, for 25 to 30 minutes. The water is drained away and the rice is placed back into the hot pot, tightly covered and left to steam, off heat, for about 10 minutes. I've found that 25 minutes yields rice that is firm and chewy while after 30 the rice is still chewy, just a bit more soft and tender. The grains are consistently light, still intact and fluffy without being mushy at all - I used this method this morning so the rice had enough time to chill out in the refrigerator to make this Snow Pea-and-Pork Fried Rice for tonight's dinner. There is one thing you want to keep in mind for stir-frys - have all your ingredients chopped and prepped before you start heating the pan because the action moves quite fast! Scrambling a couple eggs was up first. Once they were done and removed, strips of boneless pork chops that we briefly marinated in soy sauce and dry sherry were next to hit the shimmering toasted sesame oil in our skillet. Since the pork was thinly sliced, they take literally a minute or two to cook through. Sliced onions, snow peas and a handful of chopped broccoli florets were on tap to be tossed in - after a couple minutes of rockin' and rollin', pungent fresh ginger and a couple cloves worth of minced garlic were added. The ample veggie mixture was then transferred to the plate with the pork to keep warm while we heated up another drizzle of dark sesame oil in the pan. That chilled nutty brown rice was then added to the skillet and left to sit for a minute to heat up - all the cooked ingredients were then thrown back in and tossed together to warm through. Finished with a shower of mild green onions, Jeff and I both thought this would good, but we think it could have used a little more "oomph". Maybe a little tamari or regular soy sauce at the end? I also think we should have just poured the eggs in at the end and let it scramble during the tossing process to remove a step. Can we tempt you with these Amish Molasses-Ginger Drops? If there was only a way I could invite you in to smell the aroma that graced our kitchen while I was making these Amish Molasses-Ginger Drops for the Weekly Wednesday Treat Day today. While the cookies are filled with alluring spices, the dough is given a fresh twist with tiny shreds of brilliant lemon zest. To infuse those bright oils in the zest into the cookies, we borrowed a tip that we have really taken a liking too and used quite a few times now from Dorie Greenspan. The technique is to take the zest and first rub it into the sharp grains of granulated sugar, which makes an incredibly fragrant sugar - you can use the same process when a recipe calls for any zest to be added. Most recipes will just have you add any zest with the other wet ingredients, but in my opinion, this lures the essence out from the zest and is worth the extra minute or two. While most of the sweetness comes from granulated sugar, the cookies are also given the addition of a rich, thick molasses to give them a robust background to stand up to the spicy ginger and cloves in the dough. This also has the benefit of giving the cookies an attractive burnished finish. Once the cookies had cooled from their trip in the oven, we took one more additional step to push them over the top. 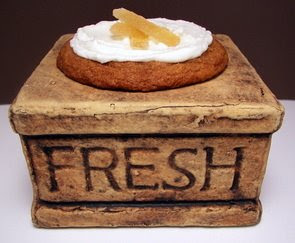 Confectioners' sugar, a little softened butter and a squeeze or two from a fresh lemon are stirred together to create a gleaming white creamy frosting that we swirled on top of each cookie. 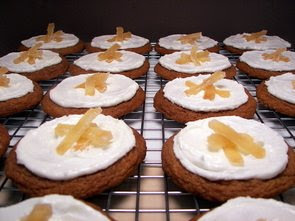 To tie in with the ginger in the cookies, we thinly sliced a few rounds of crystallized ginger and placed them on the frosting, livening each up with a pleasurable sweet heat. A little crispy around the edges with a candy-like chew as you reach the center, I can see us making these moist cookies several more times, especially in the fall. When I looked at the forecast for the week when I was menu planning, they had talked about it being quite hot and humid today (the dew points are in the 70's... aka instant-sweat if you step outside! ), so I took that into account when choosing a dinner tonight. Once was bad enough, but I didn't want to reheat the house by having to turn the oven on twice in one day! I probably should have chosen something that didn't need the stove entirely, but I did need to boil a pot of water to prepare this Soba Salad with Soy-Wasabi Vinaigrette. The good news is that this heat doesn't tend to linger like the oven does! 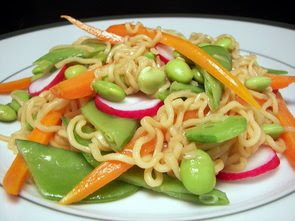 The noodles you need for this salad are Japanese curly noodles, which you would typically find labeled as "chucka soba". Depending on the store, I've seen them in various locations from the ethnic section to the pasta section or one place even had them with Ramen noodles. The noodles cook quite fast and have a very mild flavor. 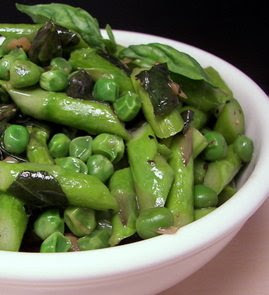 This salad is packed with vegetables such as edamame (green soybeans), crisp snow peas, tender whole baby carrots that we quartered and peppery radishes. While the radishes are kept raw for their crunch, the others are steamed just until crisp-tender, then shocked in icy water to set their color and stop any carry-over cooking. If you have a steamer than sets on top of the pan that you cook the noodles in, you could save yourself some time by pulling the noodles out with tongs and placing them into a colander to drain and rinse, rather than dumping that hot liquid. The water will come back to boil in a snap, so you can continue on with the veggies right away. To moisten and dress this noodle salad, a combination of tangy rice vinegar, soy sauce, dark toasted sesame oil, spicy wasabi and a pungent clove of minced garlic are whisked together. If you've never had wasabi before and like things on the milder side, you might want to reduce the amount of wasabi to two teaspoons. We like things pretty hot and we both thought the wasabi could have even been bumped up a bit for our tastes. If you feel the need to add some meatiness to this veggie-filled dish, I would think some sautéed or poached shrimp (add them when cooking the noodles!) would be a nice touch. Jeff and I snack on carrots quite a bit (usually with some sort of dip), but don't have them often enough as an actual side dish at dinner. I was trying to come up with something easy to serve with the main portion of our meal tonight and decided on these Roasted Carrots with Honey. We drizzled chunky sticks of peeled carrots with olive oil and seasoned them simply with salt and fresh ground black pepper. If you find that your carrots are especially thick, you'll want to halve them so all of the pieces cook in the same amount of time. 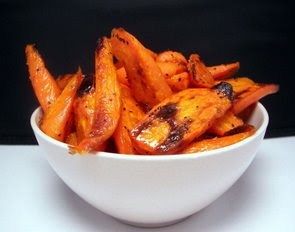 The bright orange sticks are then roasted at a high temperature, allowing them to turn tender enough to bite through, but not so much that they are mushy. To accentuate their sweet quality, we took a dollop out of our favorite jar of fragrant orange blossom honey and let it drip down over the warm caramelized carrots. I know a tablespoon worth of honey might not seem like much to a pound and a half of carrots, but as the sticky syrup hits the hot pan, it thins out to give each tender piece a shiny coating. With five ingredients in total, this snazzy side could be served with a variety of different main dishes and would be a good way to lure those picky eaters to try out this vegetable with its hint of sweetness. Along with those roasted carrots, I prepared this Goat Cheese, Prosciutto and Leek Frittata for tonight's dinner. Rather than using completely whole eggs for this dish, I used a combination of whole eggs that I cut with egg whites. Whenever I do this type of substitution, I always like to remain heavy on the whole eggs as their yolks give needed richness - I find that if it sways the other way, the end result is a little more spongy and a little too light. To loosen the egg mixture up, we whisked them together with just a few tablespoons of milk. I used a large skillet, about 12" in size, to melt the butter we used to soften the leeks. If you've never worked with leeks before, you'll only want to use the bottom white and light green portions - the darker leaves are quite tough (though, how about saving them them for a batch of stock?) and shouldn't be used here. Because they grow in sandy soil, leeks can also hide a lot of grit in between their layers, so be sure to rinse them well before using them. Once the leeks were soft, we stirred sliced salty prosciutto, fresh chopped basil leaves and a handful of creamy crumbled goat cheese into the bowl of whisked eggs. Once poured into the skillet, we kept the eggs movin' with a spatula until most of the liquid had turned into curds, yet the eggs were still wet. At this point, you'll want to smooth those curds out into an even layer and let the bottom reform a crust - we then scattered a bit more goat cheese on top and slipped the frittata under the broiler just long enough to set the center of the eggs and give a light golden finish on top. If you want to test for doneness, stick a knife into the center - it should come out clean, but the hole left behind should be slightly wet as the frittata will continue to firm up as it cools. Even though Jeff sat at the island and watched me prepare this (and didn't say anything! 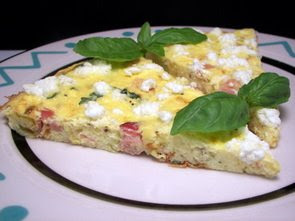 ), he confessed after a few bites that he was afraid this was going to be pretty bland because the volume of the rest of the ingredients compared to the eggs and egg whites didn't seem to be enough. However, he was quite surprised that those few ingredients could end up adding so much flavor! If you are using a good quality prosciutto, you don't need much to give that salty depth and a little bit of goat cheese goes a long way when crumbled and layered as in this dish. The basil gave a needed pop of freshness while the leeks added a mild onion-y flavor that complimented the dish well. I put six servings on this, but we ended up with more like four as we both couldn't resist going back for another wedge! 10 new recipes were made in the kitchen this round and Jeff chose the picks this week - they were that Malaysian Chicken Pizza, Poppy Seed Doughnuts and those Chipotle Pork Burritos. Besides keeping our basil plants under control by making batches of pesto (which freeze so well in tablespoon portions! ), I'm also trying to pull out recipes from our piles that use the fresh sweet leaves while they are so handy on the deck. 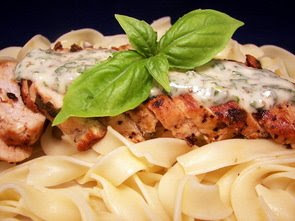 That is the main reason I choose this Lemon-Basil Chicken with Basil Aioli dish to make for dinner tonight! 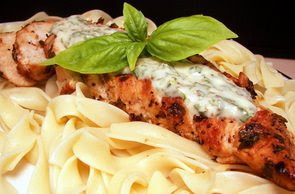 With most recipes where you are putting herbs on a piece of meat, you are using their dried counterparts - however, this takes a turn from the norm and uses chopped fresh basil and green onions instead. Those two are brightened up with fresh lemon juice, tangy vinegar and lemon pepper. With everything being so wet, I did find it a little difficult to get the mixture to actually stick to the chicken, but in the end, most of it actually did stay put. While we were waiting on the coated chicken breasts to cook through, I started on the creamy basil Aioli. Aioli is a combination of garlic, oil and usually an egg yolk - so, basically a flavored mayonnaise. This recipe is the same basic concept, except the flavors are blended into already prepare mayonnaise. Those flavors come from a simple combination of fresh basil, lemon juice, Dijon mustard, minced garlic and a drizzle of olive oil. When the chicken breasts were done and had rested a few minutes, we sliced them and served the aioli on top. The aioli was quite potent when I tasted it by itself, but when eaten with the tender slices of chicken, the two melded together well without competing with one another. To round out the meal, I decided to serve these with some buttered and lightly salted egg noodles on the side. If you don't feel like serving this with pasta, you could also use the aioli as a spread and turn this into a fantastic chicken sandwich! Put those doughnut pans to work! Do you ever get a kitchen gadget or piece of baking equipment that you can't resist the urge buy when you think of all the things you could make if you had it? I do that too often myself... just like those fancy doughnut pans I told myself I couldn't live without years ago. I have used them maybe a total of three or four times and they mock me as I walk past the "shelf of rarely used goodies", knowing that I probably won't be picking them up today. 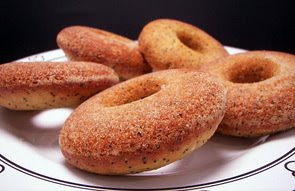 Color them surprised when I finally reached for the pans so I could make these Poppy Seed Doughnuts! Before I began working on the batter, I toasted a couple tablespoons worth of those blueish-grey poppy seeds to intensify their nutty flavor. For the batter, I did use a blend all-purpose flour and whole-wheat pastry flour to bump up the nutrition in these while keeping them light - however, they would work just as well with entirely all-purpose flour or even using white whole-wheat for the pastry flour part. To moisten the batter, I used plain yogurt for the majority, along with a little tangy buttermilk and canola oil - you could use sour cream, instead of the yogurt, if you want to bump up the richness. 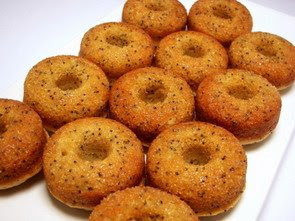 Since lemon and poppy seeds have such an affinity for one another, a couple teaspoons of the fresh oily zest are also added in to brighten the flavor. 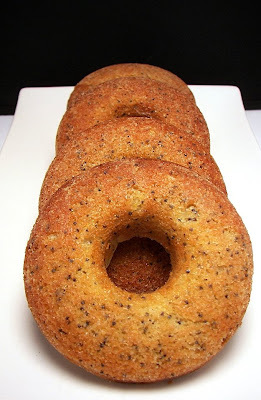 The batter for these doughnuts is quite thick, but is still workable if you want to use a spoon to fill up the molds - however, if you just scoop it into a pastry bag, you can make short work of this process! 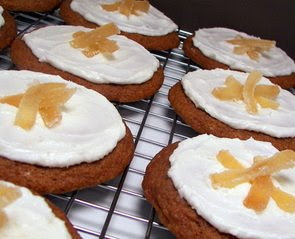 Instead of dipping these in a sweet frosting once they are baked, we added that extra sweetness in another way. 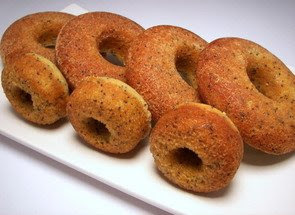 After I coated the doughnut pans with nonstick spray, we sprinkled each well with granulated sugar, which ended up being a crunchy golden finish on the baked doughnuts. I have two pans - one for large dougnuts and one for mini's, so I split the batter between the two for fun. If you only have one pan, you can certainly bake these in two batches - just quickly clean the pan to cool it down, recoat it with nonstick spray and dust with sugar. These would also be a great excuse to bust out those decorative mini bundt pans you might have laying around! While you can't expect them to be as meltingly tender as a classic fried doughnut, for a cake doughnut, Jeff and I both quite enjoyed them. They were moist, without being wet or gummy, and those bits of poppy seeds peppered throughout each brought a pleasing textural crunch. Neither of us missed a glaze as that sugary topping was the perfect ending note. You know, I think I could really get used to this. Last Friday we had that unusual, but delicious, Nectarine and Prosciutto Pizza - I decided to follow that up this week with a Malaysian Chicken Pizza recipe we came across. Saturday night has always been our plain 'ol chicken and greens salad night, so maybe we'll have to start making Friday pizza night! As usual, I used our favorite whole-wheat pizza dough recipe that has become such a staple, though, this time I made the 12 ounce variation. The directions are the same, but the ingredients have been slightly scaled down - you'll find those if you scroll down a bit on that page. Once I had gotten the dough together, I started sautéing a couple chicken breasts that I chopped into small chunks. After they had caramelized, I moved them to a plate and added quite the list of ingredients to create a sweet and quite tangy barbecue-esque sauce. Rice vinegar, brown sugar, soy sauce, garlic, fresh ginger, natural peanut butter and a few flakes of crushed red pepper are brought to a boil and cooked until the liquids begin to thicken. The almost-done pieces of chicken are returned and allowed to cook through - at this point, the sauce should be thick and a little syrup-y; if it looks a little too loose, allow it to bubble away a bit more. A combination of nutty Swiss cheese and shreds of mozzarella are actually scattered first over the rolled out dough. 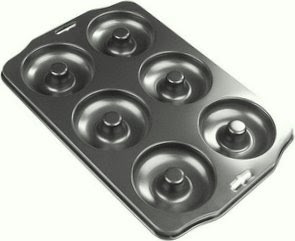 This is to keep them from turning too brown as the pizza is cooked at a roasting 500 degrees, without pre-baking the crust. When you go to add the sauce with the pieces of chicken, just distribute out the pieces of chicken and then dribble the sauce as evenly as you can. 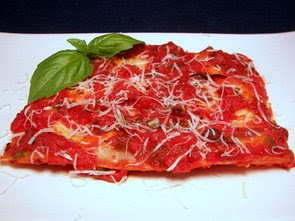 You do not have to worry about getting the sauce smooth and completely even over the entire surface - as the pizza cooks, you'll see that those dribbles of sweet sauce will begin to bubble and fuse together. This is why you let the sauce thicken before you add it to the pizza - if it is too thin, it might bubble over the crust and onto the bottom of the oven. Not a good thing! Right as the pizza came out with its crisp crust, we sprinkled the surface with sliced greens onions and let it rest a few minutes as that sauce on top was molten from the rich brown sugar. When I was making the sauce, I thought that the amount of vinegar seemed like a lot, but I didn't notice the finished product being harsh or vinegar-y at all. In fact, I was a little taken aback by the sweetness, but the savory soy, garlic and crushed red pepper kept it from being cloying and distracting. The peanut butter took a back seat to the rest of the flavors, but it definitely helped with the texture while the fresh ginger left a lovely lingering bite in the background. Max made sure to let me know bright and early this morning that someone has been without any homemade treats for a couple days! 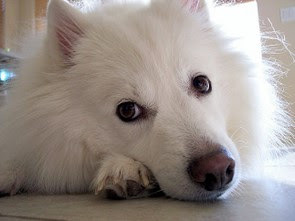 How could one resist this face? We have done a lot of cut-out treats lately, so this time I wanted to do something a little different and came up with these Banana-Carob "Pup"scotti. I used a mixture of whole-wheat, rye and oat flour for the dry ingredients - I know that oat flour may not be the easiest ingredient to find, but I stopped looking a long time ago and just make my own. How? Just toss dry oats into a spice grinder and let 'er rip until it is pretty fine in texture - you could also use a blender or food processor. 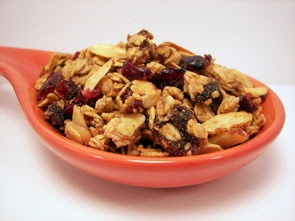 If you wanted to intensify the nutty flavor found in the oats for a recipe you might be making for yourself, you could also toast the oats and let them cool before grinding. To make these a little more tempting, I also chopped up a few peanuts and added them in. Mashed banana is the main moisture component, however to still give them a decent texture and add a little healthy fat, a couple tablespoons of canola oil is added. If the dough seems a little on the dry side when you combine the wet and dry ingredients, don't be afraid to sprinkle on some water to get it to come together. When you dump it out onto your counter and start working with it, you want it to be just tacky to the touch, but not overly wet or so dry it won't hold together - just add a little more flour or water if needed. Since I didn't want the biscotti too wide or long after slicing, I divided the dough in half. Before I rolled each piece into logs, I wanted to make one half extra special and reached into a bag of carob chips to toss in about 2 tablespoons worth. You can also add 1/4 cup to the whole batch or just leave them out entirely - just don't substitute real chocolate as that it not safe for dogs. 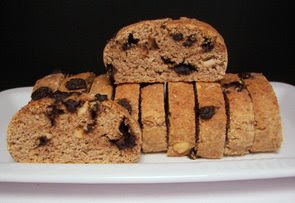 Treat these just like any ordinary biscotti - bake until they are firm to the touch, let them cool slightly and then slice. I usually slice my biscotti on the diagonal, however since I didn't want them to be too large, I sliced the logs crosswise to not increase their length. The time for the second bake will vary as it depends on how thick you slice them - you want them to be golden and just slightly soft in the center as they will continue to crisp up as they cool. I couldn't tell you for sure which one Max enjoyed the most, but I can say that he snarfed both of them down, which means he gives them 2 paws up! Jeff, unfortunately, isn't the biggest fan of blue cheese, but I'm working on him to try and and change his mind! Don't get me wrong, he doesn't hate it, but he doesn't get nearly excited about it as I do. 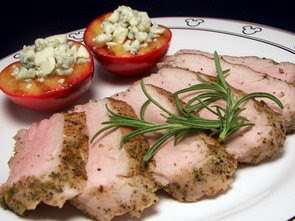 I picked this Peppered Pork Tenderloin with Blue Cheese Plums to try out tonight because if he didn't end up liking the plums, he would still have plenty of food free of blue cheese on his plate! Starting a couple hours before I wanted to grill the lean tenderloin, I made a rub of fresh rosemary, licorice-y fennel seeds, coriander seeds along with salt and fresh ground black pepper. If you don't happen to have a spice grinder handy to make this, you could just mash those ingredients together in a mortar and pestle. If you don't have one of those handy, just crack the seeds with the bottom of a heavy skillet, finely chop the rosemary and rub everything together with your fingers. I rubbed this onto the pork, wrapped it up tight in plastic wrap and let it chill out for a bit. While the meat was resting, we halved the plums, removed their pits and gave them a light bath in olive oil. 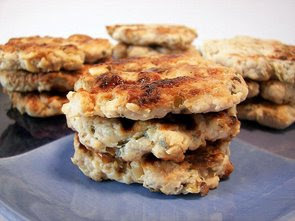 We then grilled them, cut side down, to caramelize their sugary surface - as soon as they were done, I scattered the tops with the piquant crumbles of blue cheese. The warmth from the plums warms up the cheese, melting it ever-so-slightly, allowing it's flavor to bloom. 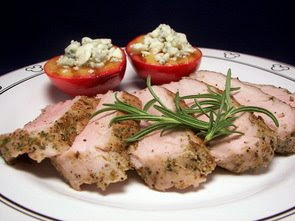 The pork was tender and juicy with the fragrant rub making itself well present, without making the meat seem too earthy. 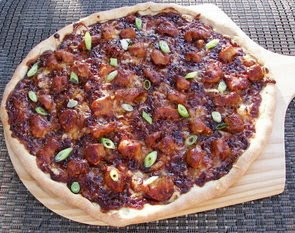 I liked taking a slice of the of the plum/cheese mixture and eating it with a bite of the pork - the combination of savory, salty and sweet lived up to its expectations. I looked over to check and see how Jeff was making out and much to my surprise, the plums were gone before he finished his slices of tenderloin! Score! I see more blue cheese dishes in our future. We've had some heavier dishes as of late, so I made sure to plan a couple dishes this week that would be fresh, light and full of summer flavor. 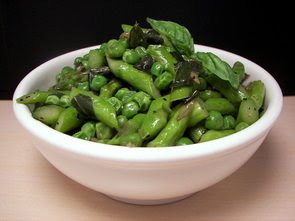 For this simple side dish tonight, Asparagus, Peas and Basil, we took advantage of the asparagus we picked up from the farmers market and our bountiful basil plants that seem to be tripling in size on the deck. The original recipe called for a full three tablespoons of butter, but we knocked that back to one and a half - this still gave us plenty of flavor and enough moisture to cook the vegetables in. For a more delicate onion flavor, we softened a couple chopped shallots in that melted butter, then tossed in the sliced asparagus and peas, along with a couple pinches of salt and a dash of black pepper. If you have access to fresh peas in the pod, by all means shell 'em and use them- you'll need about 3/4 pound worth of the mossy green beauties. To ensure all of the moisture from the butter is trapped inside the pan to steam and infuse into the vegetables, we sealed the top of the pan with foil as soon as they were added. Depending on the thickness of the asparagus spears, it should only take about 4 to 6 minutes to become tender, yet still retain a little bite in the center. We tore up and added a heaping mound of sweet anise-y basil leaves to bring the dish to life - right before serving, be sure to taste a piece of the vegetables and add a couple sprinkles of salt if they need a little boost. For the protein portion of tonight's dinner, I had to actually start this Southeast Asian Grilled Flank Steak last night. 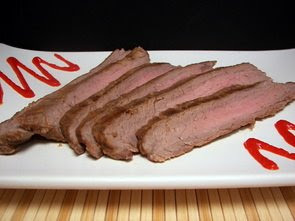 To give the steak enough time to absorb and take on the Asian flavors, it needed to sit and stew overnight in a mixture of fresh lime juice, fish sauce, just a little granulated sugar to balance the tartness, Sriracha (hot chile sauce), ground coriander and a couple cloves worth of minced garlic. Grill it to your desired degree on doneness - we try to keep things around medium to medium-rare to keep the meat tender and juicy, so this took us just about 4 minutes per side. Make sure you plan enough time for the steak to rest at least 5 to 10 minutes so the juices stay inside and don't run out when you slice into it. You'll also need to take note that you are going against the grain of the steak when slicing to ensure it won't end up stringy or tough. Spicy, but not hot, the racy flavors of the lime juice, fish sauce and garlic took charge and seemed to wiggle their way into every fiber of the steak, ensuring that each forkful would make your taste buds dance. You could serve this just by itself as we did, use it to bulk up a green salad or serve with rice noodles tossed with vegetables. I'll admit it and I know Jeff would do the same, we are both chocolate fiends... which made me quite excited to get started on the Weekly Wednesday Treat Day item today. 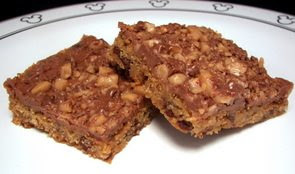 These Caramel Crunch Bars have a decadent duo of chocolate with a sweet candy topping. Shortbread dough is the base of these bars, but this is more than just a flour, butter, sugar and salt shortbread - this dough is perked up with a bit of espresso powder, cinnamon and pairs brown sugar with granulated sugar to add a caramel-like essence. 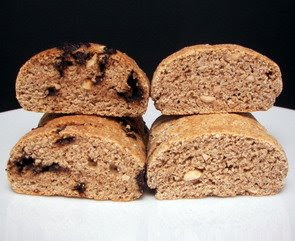 The first chocolate addition comes in the form of finely chopped bittersweet chocolate stirred in at the last moment to stud the dough with dark speckles. When you go to scoop this into your baking pan to cover the bottom, you'll find that this dough is very thick and sticky. You can struggle with using a spatula and your fingers to get an even layer, which can be a little frustrating and messy. However, you could instead drop dollops of the dough all over the bottom of the pan and then lay a sheet of plastic wrap on top - then keep your fingers clean to freely squish the dough all over, connecting the dollops to make a smooth layer. If you happen to have a baby rolling pin on hand, that would also work well with this method! Once the cookie base was baked to a rich golden brown, we brought in the second addition of chocolate by tossing on chopped pieces of sweet, creamy milk chocolate and then placing the pan back into the oven. You are not trying to cook the bars anymore, but the pan is left inside the warm oven just long enough to soften the chocolate, allowing you to spread it into a slick layer on top. I mentioned decadent right? Well, we were not done yet - these buttery bars are then generously showered with chocolate-covered toffee bits for a crunchy topping. 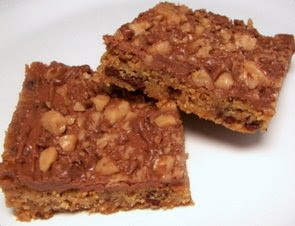 If you can't find those, you could use plain toffee bits or even chop up a couple Heath toffee bars for the same effect. So... I had a wave of that déjà vu feeling when I was making these, but I just let it go. Then, when I was eating my "quality control" piece, I could have sworn I've tasted these before, but I was so enraptured by the bars I forgot about it again. Now, I get to this point in typing the post and Jeff says "Those bars were so good, but I feel like I've eaten them before". Me too, I said! So, we both go at racing speed to check the blog and guess what? Sure enough, just over a year ago in June we made them for a treat day.... oh crap! The good news is that we were still in Maryland, but still. It was interesting going back to see what I did with the recipe, using all bittersweet chocolate and vanilla sugar instead of granulated. I do think though that I liked the milk chocolate and bittersweet combination better than completely bittersweet. Either way, I guess this was a sign that if you haven't given these a try yet, they are too good not to! Dinner was a new recipe at least and Jeff has already requested that it definitely needs to make a planned re-appearance at some point. 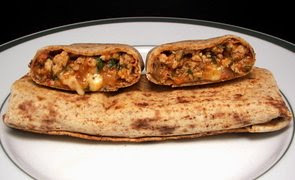 I started these Chipotle Pork Burritos by warming up a pool of canola oil to brown three-quarters of a pound worth of lean ground pork. We took out the crumbles and then drizzled in a little more oil to begin cooking chopped onions and a couple cloves of garlic. We also seasoned that combo with smoky cumin and distinct ground coriander. The pork is tossed back in and the mixture is made saucy by adding a mild salsa - we went with mild as we were also adding a couple minced chipotle peppers in adobo sauce to ratchet up the spice. Once the ingredients had warmed through, we freshened up the mixture with a small handful of chopped cilantro. Not a fan? Swap it out with parsley! 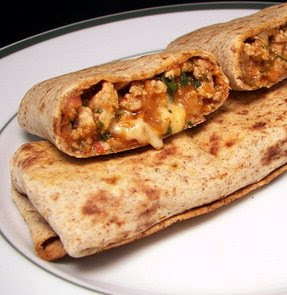 You can assemble these burritos with a classic large flour tortilla, but we decided to use those fun Flatout wraps. We have both really grown to love these since we tried them in those chicken roll-outs we made awhile ago. We spooned the moist pork filling down the center of the wraps and topped it with shreds of sharp white Cheddar and diced red bell pepper. The recipe called for diced tomato too, which would have been a nice addition, but I overlooked that when I went to make our shopping list for the market - oops! To heat them through, melt the cheese and add a slight crispness to the outside, the assembled wraps go into the oven for a few minutes. Juicy and cheesy with a pleasant smoky kick from the chipotles, I know I will be preparing these again to store in the freezer when we need a quick lunch on a busy day. I'm betting you could even stretch this out and make a few extra servings if you added a bit more salsa and beans! I managed to make quite a mess in the kitchen today... and the food processor certainly got a workout! I needed to get a couple batches of Jeff's favorite Chicken Breakfast Sausage, so I got that out of the way first. These sausages freeze so well and reheat in a flash when he needs to have a quick breakfast. Then, I had to whiz up some homemade peanut butter (having a second bowl for the food processor comes in quite handy for days like this!) so I could get around to making yet another batch of the Peanut Butter Granola we seem to go through too quickly! Now after all that, I still had to get dinner goin'! Since I had planned on getting all this done, I already knew this Supper Sesame Rice Omelette I picked out would be a good fit today since a lot of the time required was off-hands, waiting on the brown rice to cook! You don't have to do this, but I used a mixture of vegetable broth and water to give the grains a little extra boost as they absorbed the cooking liquid - you could use all water though if you wanted too. A few minutes before the rice was done, I started softening a sweet red bell pepper, couple green onions and a shredded zucchini a friend gave us. When the rice was ready and still pipping hot, we tossed in a couple tablespoons of toasted sesame seeds and drizzled it with pungent sesame oil. 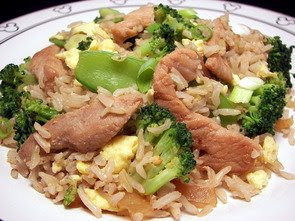 The sesame flavored rice is then tossed into the skillet of vegetables, quickly followed by a combination of eggs, salty soy sauce and fresh ground black pepper. Stir it to combine for just 30 seconds, then leave it be so the eggs can almost set and form a golden crust on the bottom. The eggs won't be completely set, but they will finishing cooking as you blast the skillet under the broiler long enough to brown the top. There are just enough eggs added to hold the rice together, yet not so many that it feels like fluffy frittata. Because there was quite a large amount of rice, I thought it might be a touch on the bland side, but the flavor from the sesame seeds and rich oil took very good care of that. The slices were thick, substantial and I loved how the zucchini blended into with the rice... and yes, I even had to play the "do you know what you just ate?" game with Jeff after the pieces vanished from his plate. He was a little grumpy that he ate zucchini as he claims he only likes it in cake or bread form, but I think he has finally come to the conclusion that nothing is safe from vegetables anymore! Hee hee! 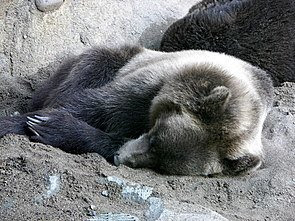 We had a fun day today, but are pretty tired! My sister Jen and her husband came up to see us and we took them to the Minnesota Zoo! We thought we would share some of the snaps we took along the way. 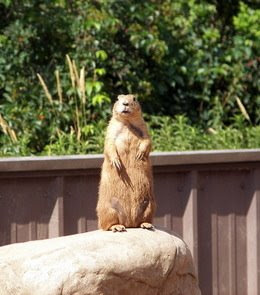 Now, unlike that unsociable bear, this little prairie doggy was more than willing to show off for us! 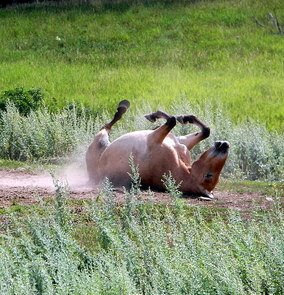 This next animal is a true "wild" Asian horse - I think he got tired of getting bitten by flies and decided to squash them all! 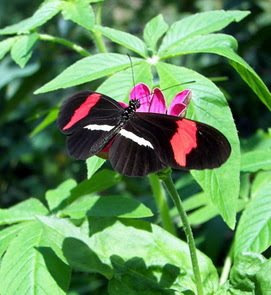 And last, but not least, one of the best parts of the zoo - the butterfly garden! This is one popular part as you can walk through with 40 different species of butterflies swirling and fluttering around! Now, back to our regular scheduled programming! We had a total of 8 new recipes over this past week - peeking back through, our favorites were those squishy Strawberry Marshmallows, that Nectarine and Prosciutto Pizza and Jeff's choice of the week, the Cherry Ripple Sour Cream Coffee Cake. I've had just a few wonton skins leftover in the freezer for quite awhile now and have been looking for a recipe that didn't need a ton to get them used up. After searching those our stacks of recipes and in the interest of being exhausted after the zoo, we went with this Lazy Lasagne with Tomato-Basil Sauce dish that almost used up the rest of the wontons. The remaining wontons that we didn't use, we lightly coated with canola oil and sprinkled with cinnamon and sugar, then baked them as the lasagne did its thing for a crunchy snack after dinner! While we waited for a pot of water on the stove to come to a boil, we began the homemade sauce by heating a clove of minced garlic in a knob of melted butter. Once it's fragrant aroma released, we stirred in fire-roasted crushed tomatoes, a sprinkling of crushed red pepper for depth along with a little dried basil. Whenever you add dried herbs like this, be sure to rub them between your fingers to get their oils groovin' before you toss them in. After simmering a bit, the sauce tightened up well - we added some zing with a shot of fresh orange juice and refreshed the basil flavor with shreds of the fresh herb. As the sauce was working, we briefly cooked the wonton skins... and when I say brief, I mean just a quick dunk in boiling water. The original recipe just had you dump them all in, but I suggest sticking to 3 or 4 at a time so you won't have any issues with sticking or tearing. You'll need to have a shallow dish of icy water handy so you can shock the thin wonton skins and stop their cooking as soon as you dunk them. Those wontons are then stacked in four piles on top of a pool of sauce with a cheesy ricotta spread in between. Since you don't want the stacks to dry out, the are drenched in the remaining red sauce and are then slid into the oven to warm through. While it wasn't as laborious as a traditional big layered dish, I don't think I would classify this as "lazy" either as was still a fair amount of work involved - I would have swapped out Lazy for Wonton and saved that label for a skillet interpretation where it is all just thrown together! For a quick and dirty lasagna(e) that generously served two, we did both think the flavor hit the spot - however, the stacks are not too impressive to look at and I did kind of miss the bite from a heavier pasta sheet. Jeff has been asking when I was going to make another treat for us to have at home (meaning he didn't want to share with anyone else! ), so I thought I should get something in the oven this morning. 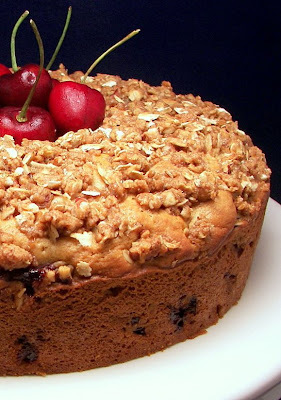 To take advantage of the fresh cherries in the market before they get outrageously expensive again, I started working on this Cherry Ripple Sour Cream Coffee Cake before he even crawled out of bed! Before I started mixing the batter for the cake, I needed to toss together a nutty streusel - this is a mixture of white whole-wheat flour, hearty rolled oats, brown sugar, toasted pecans and generous pinch of fragrant cinnamon. To moisten the mixture, forming tasty nuggets, canola oil and orange juice concentrate are drizzled in. It should be crumbly and hold together if you squished it between your fingers, but it shouldn't be too wet. To give the cake a little buttery flavor, yet up the health factor, the fat used for the batter is just a couple tablespoons of melted butter that we mixed with canola oil instead. 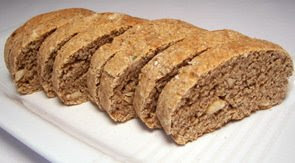 We also cut the all-purpose flour with whole-wheat pastry flour as we usually do. When you add the dry ingredients into the wet, you will be alternating it with sour cream to add a tender crumb and keep the cake quite moist. This process just allows the batter to stay cohesive and smooth through the whole mixing process. Once combined, the batter is then studded with chunky pieces of those fresh sweet cherries. 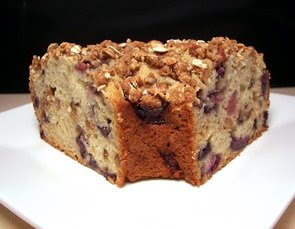 Because the sweet streusel mixture is quite generous, it is actually layered in the middle of the cake, along with the finishing sprinkle on top. I didn't notice the original recipe called for a 9" tube pan until I went to spray it, but all I have is a 10" and I wasn't about to run out and pick one up for one recipe. All this did was make our cake a touch shorter and cook a bit faster - if you do have a 9" pan, you may need to increase the total baking time to about 55 minutes or so. About 15 minutes before the cake was ready, I heard a few thumps upstairs - this would be Jeff and the pup finally joining the awake world as the delicious scent reached the bed and acted as a leash, pulling them down to see what smelled so darn good. Too bad for them though, they were none too happy to find that the cake still needed a few minutes to finish and then had to cool down! No, I wasn't secretly laughing at this point or anything... hee hee! 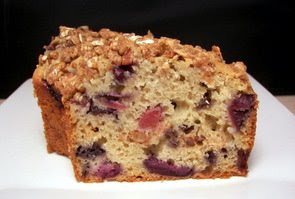 The golden cake itself was tender and moist while the cherries were plentiful and juicy. The streusel was a nice hidden surprise layered inside the cake as well as being on top - I did find that it was a little tough getting nice cuts as that streusel on top got in the way a few times. If you don't have orange juice concentrate, I would have no problem using the same volume of fresh orange juice along with a bit of the zest from said orange. We don't make homemade pizza nearly as often as we should - I'm thinking that we may just have to dedicate at least two or three days a month to try out different variations. 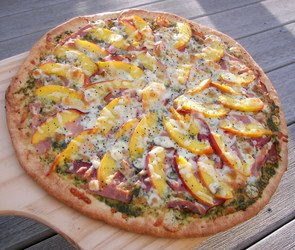 When I went to pick up the nectarines for that curried chicken salad from last night, I also picked up a few extra for snacking on and one to make this unusual Nectarine and Prosciutto Pizza for dinner. As with most pizza's we make, I did use our favorite homemade whole wheat pizza dough - one caveat though, I swapped out the all-purpose flour for bread flour to make the crust a little more sturdy* and crisp. Saying that, we've made this dough several times with all-purpose flour and it has never let us down in taste or texture! Once we patted the dough out on a crunchy cornmeal dusted peel, we slid it onto a fiery hot pizza stone to pre-bake the crust a little. When you take the crust out to top the pizza, flip it over so the lightly browned bottom now becomes the top. We first spread a thin layer of basil pesto on top, followed by a scattering of smooth provolone cheese and pungent blue cheese. Next comes shreds of salty prosciutto along with thin slices of the fresh, sweet nectarines. A bit more cheese is rained down before the pizza goes back into the oven to finish crisping up the bottom and melting those luscious layers of cheese. Once I got the pizza into the oven, Jeff was giving me that "what the heck are you thinking" eyebrow raise and finally let loose with "do you really think that this is going to taste remotely good?". You would think he would have learned by now... right? To pull those sweet and salty flavors together, right before serving, we drizzled the pizza with a syrup-y aged balsamic vinegar and a sprinkling of fresh ground black pepper. As I said, Jeff was so concerned I caught him shuffling around looking for a back up! 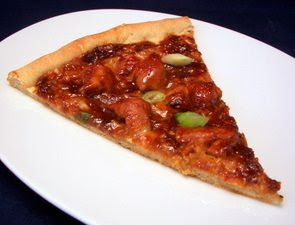 However, since he made me go for the first slice, just in case, I knew he had nothing to worry about. I have to admit, I was a little worried that it seemed like a bit too much going on for pizza, but once I sunk my teeth through the warmed fruit, melted cheese and hit that crisp crust, I was sold! That finishing touch of balsamic was magic and I'll have to remember to try that out with other recipes. And as far as Mr. Unsure? I caught him going back for an extra slice even after I stashed them in the refrigerator! *If you have a grill, by all means you could just as easily prepare the pizza on the grill so you don't heat up the house - I would recommend using bread for the dough if you plan to grill it for a little extra strength. Just flop the dough circle onto the grill, close the lid and cook the crust for three minutes or so, until the bottom is lightly browned. Flip the crust, spread all the goodies on top just as directed in the recipe and it will be done in a quick 8 minutes - just enough time for the cheese to melt and the bottom to crisp. The smoky flavor that would permeate into the pizza from the grill would be an excellent compliment to this sweet and salty pizza. When we moved into the house out here in Minnesota last year, most of the landscape plants had already dropped their flowers and it was just greenery left behind. 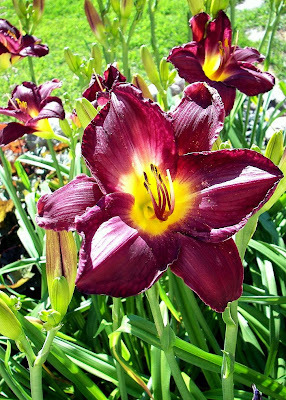 Now that we've come to being here almost a full year, it has been fun seeing the surprises that are springing up - take this beautiful flower for example! While we were not able to get a garden in the ground this spring (we are getting things prepared for one next year though! ), I did get a few pots worth of herbs and vegetables onto the deck and they seem to be doing quite well! 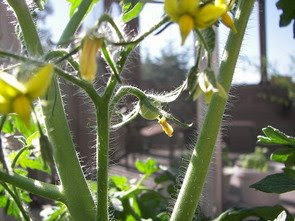 In fact, I spotted our first tomato with lots of flowers beside it to hopefully continue the trend. On a whim this past spring, I also picked up a small packet of chive seeds to give them a go as well... by this morning we finally had just enough to harvest (we started them a bit late in the season!) and make these Cheddar Cornmeal Biscuits with Chives as a side for dinner tonight. I'm more of a fan of drop biscuits as they are less messy (no rolling!) and can go from bowl to oven in just a few minutes. However, we were both quite happy with how these came out and it didn't take that much extra time, especially with a little help from the food processor! I love crunch, so we used a more coarse stone-ground cornmeal for these, but don't let that stop you from giving them a try if you only have a finer meal. 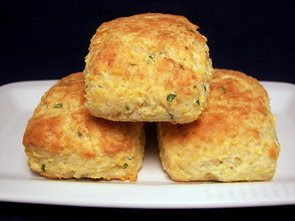 Since there is not a ton of butter in the dough, use your best extra-sharp cheddar to ensure a well-flavored biscuit. Besides adding a mild tang, sour cream adds the moisture needed to bind the biscuit dough together, keeping them tender and light. We also added just a tablespoon of honey to add a kiss of sweetness (and also gives them a little color), but it is not required and can be left out if desired. Now, instead of hauling out the rolling pin and biscuit cutters, the dough is just patted out into a thick rectangle and cut into squares. No scraps or re-rolling needed... how easy is that? If you want to be a little naughty, you can always brush a bit of melted butter on top once they are baked, but we were happy enough with them as is. 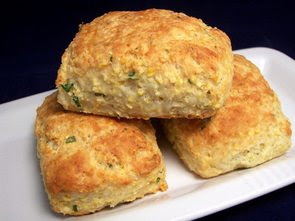 You can see the pearls of cornmeal in the finished biscuit (especially if you view the larger picture) - they added a light crunch, but they do soften a bit and are not hard little nuggets. The chives added an innocent onion-y background that just seemed to fit in naturally with the bite from the cheese and the moist biscuit. 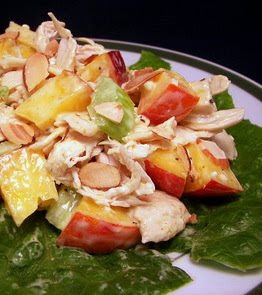 To go along with the biscuits, I made this Curried Chicken Salad with Nectarines that we served on a few leaves of crisp romaine lettuce. You'll need about a pound of cooked, shredded chicken (this ends up being roughly 3 cups) - I just poached a few chicken breasts in broth, but you could also pick up one of those handy rotisserie chickens from the market to speed the process along. 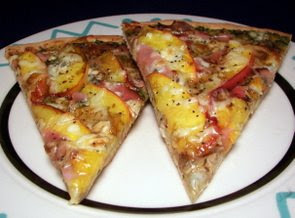 For a juicy sweetness, cubes of fresh nectarines are added with the chicken, along with crunchy celery and green onions. Nectarines are basically fuzz-less peaches, but do tend to be a little smaller and a touch sweeter. To moisten the salad, a combination of mayonnaise, buttermilk and lemon juice is whisked together. If you wanted to further lighten this up, you could use a combo of sour cream and plain yogurt, to replace the mayonnaise, but I thought the mayonnaise brought a needed richness. Besides the obligatory salt and pepper, we added just a sprinkling of hot madras curry powder to ground the salad with an earthy flavor - not too much though as it can be pretty pungent. To finish off the salad, we scattered the top with a handful of toasted sliced almonds for a nutty crunch. This could also stand up to a spicier bed of greens like arugula or watercress if you had some on hand - I also think this would be tasty served in a pita or wrapped up in a tortilla for an on-the-go lunch.